The My feed section is formed based on your subscriptions as well as personal recommendations. In recommendations you will see cards and topics that are similar to your own or those that you have already searched for. 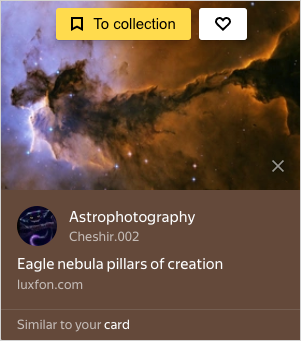 If a card appears in your feed that is not from a collection you are subscribed to, then in the lower part of that card will be details on where the card is from, such as what topic or what recommendation. Click X on the card. Hide card — this will report it as an error in your personal recommendations. The card will be hidden from your feed. Report — this will report the card and its content as inappropriate in Yandex.Collections. The card will be hidden from your feed. After checking, your feedback will be taken into account by Yandex.Collections automatic algorithms which will help improve the quality of your personal recommendations.